Hypertension or, as it is more commonly known, high blood pressure, is a chronic disorder that is becoming increasingly prevalent. It can be caused by a number of different factors, including a sedentary lifestyle, poor sleep habits, food choice and smoking. The most common treatment for high blood pressure is medication geared toward lowering blood pressure along with a suggestion to make some lifestyle changes. Unfortunately, those changes—namely diet and exercise—are unappealing at best to most people. Few people want to drastically alter their eating habits and rearrange their schedule so they can go to the gym every other day. Fortunately, there are plenty of other options that are emerging as effective ways to lower blood pressure without endlessly circling a track. One such option, yoga, has been in practice for many years. Many people balk at the idea of doing yoga because it brings to mind impressive flexibility, leggings, and a room full of yoga mats. However, that doesn’t have to be the case. Thanks to the internet, you can pick a yoga instructor who moves at your pace in the privacy of your living room, avoiding all of the unappealing aspects of the exercise. A study1 conducted in India, a country that has been practicing yoga for centuries, found that regular yoga combined with blood pressure medications can produce significant decreases in blood pressure. There were two main limitations to this study. The sample size—70 people split evenly between the two groups—was a small one. Additionally, the study only lasted 12 weeks which did not allow it to assess the long-term effects of yoga on high blood pressure. However, other studies2-7 have also found yoga to have positive effects on blood pressure. One systematic review6 of 32 articles found that yoga could lower blood pressure in both healthy and hypertensive patients. Another study5, a year-long study in Hong Kong consisting of 182 participants, found that regular yoga practice could lead to decreased blood pressure, resting heart rate and waist circumference. When the exercises for these studies were designed, the instructors kept in mind the group they would be teaching. The exercises were geared toward beginners and seniors. One case study, 7 which used resources such as a DVD and a YouTube video, evaluated the effectiveness of a modified chair yoga. This program increased safety for participants with decreased mobility or balance while still effectively lowering blood pressure. Participants also reported decreased anxiety and joint pain. Results of systematic reviews3,6,8 have been mixed on the effects of yoga. Many, but not all of the trials found positive effects on blood pressure, some of those results were statistically significant while others were not. With so many varying results, there is still more research that needs to be done to determine a true measure of the effect of yoga on blood pressure.It is important to note that, because research into the effects of yoga on blood pressure is still relatively new, this practice has not yet been shown be effective in replacing blood pressure medications. Rather, it works well in conjunction with those medications. So if your doctor has recommended a lifestyle change to aid in controlling your blood pressure, yoga may be a great place for you to begin. There are many free resources available, ranging from DVDs at the library to videos on YouTube, and it doesn’t require any equipment besides an open floor and perhaps a chair. What do you think? 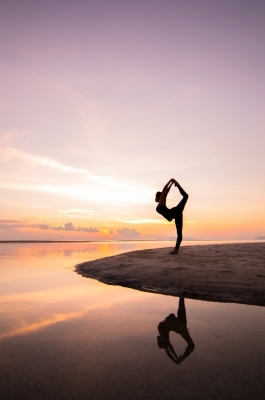 Will you try yoga to assist in controlling your blood pressure? 1. Pushpanathan P, Trakroo M, RP S, Madhavan C. Heart rate variability by poincaré plot analysis in patients of essential hypertension and 12-week yoga therapy. National Journal of Physiology, Pharmacy & Pharmacology. 2015;5(3):174-180. 2. Centre for Reviews aD. Yoga and hypertension: A systematic review (provisional abstract). Altern Ther Health Med. 2014:32-59. 3. Cramer H, Haller H, Lauche R, Steckhan N, Michalsen A, Dobos G. A systematic review and meta-analysis of yoga for hypertension. Am J Hypertens. 2014;27(9):1146-1151. 4. Hagins M, Rundle A, Consedine NS, Khalsa SBS. A randomized controlled trial comparing the effects of yoga with an active control on ambulatory blood pressure in individuals with prehypertension and stage 1 hypertension. J Clin Hypertens (Greenwich). 2014;16(1):54-62. 5. Siu PM, Yu AP, Benzie IF, Woo J. Effects of 1-year yoga on cardiovascular risk factors in middle-aged and older adults with metabolic syndrome: A randomized trial. Diabetology & Metabolic Syndrome. 2015;7(1):1-12. 6. Yang K. A review of yoga programs for four leading risk factors of chronic diseases. Evidence-based Complementary & Alternative Medicine (eCAM). 2007;4(4):487-491. 7. Awdish R, Small B, Cajigas H. Development of a modified yoga program for pulmonary hypertension: A case series. Altern Ther Health Med. 2015;21(2):48-52. 8. Centre for Reviews aD. Yoga for hypertension: A systematic review of randomized clinical trials (provisional abstract). Complement Ther Med. 2014:511-522.